MAPEI – Marco Roma has been appointed general manager of MAPEI Inc., the Canadian subsidiary of the global chemical products manufacturer. Roma will join the MAPEI Americas leadership team and will report directly to MAPEI Americas president and CEO Luigi Di Geso. His global experiences in Italy, China, France and the UK with Mapei S.p.A., MAPEI, and the Materis Group have prepared him to step into his new role easily, and his fluency in French and English will be an important asset to working with the bilingual communities in Canada. LATICRETE – Two new members have joined the LATICRETE Board of Directors, replacing directors Ron Shawn and Dr. Bernard Gustin, who are retiring after 25 years. Dr. Stephan Liozu brings more than 23 years of experience with several multinational building product companies. An author and presenter, he has expertise in the manufacturing and distribution practices of the industry. His forte is customer value management, and recent accomplishments include coaching, consulting and training for large global industrial companies. Dr. Volker Weidmann joins LATICRETE with 28 years of experience, including being the managing director of Hermann Otto GmbH in Fridolfing, Germany, for the last 20 years. Having worked extensively in sales, R & D, application support, marketing and branding, Dr. Weidmann brings a comprehensive knowledge of construction industry practices and materials. He has been elected chairman of the German Industry Association of Sealant Manufacturers (IVD). Q.E.P. Co., Inc. entered into a strategic partnership with Bissell Commercial to become a Master Distributor of the full Bissell BigGreen Commercial® line of vacuums, cleaning machines and supplies throughout North America, Central America, the Caribbean and the northern countries of South America. To support this new strategic partnership, Q.E.P. has appointed Nathan Mincey as QEP’s senior director of Specialty Markets. Mincey will be the point of contact with Bissell Commercial and will develop the sales and marketing strategy to expand their offering into existing markets as well as identifying new areas of opportunity. A job description has been developed for a Five Star Program Coordinator and has been posted on tile-assn.com. NTCA has already received resumes and phone calls about the position. Chris Dalene, new Membership Committee chair, will work with Jim Olson on committee iniatives. Meetings and appointments took place at TSP. NTCA and CTEF had a presence at the Starnet Annual Fall Meeting. Les Lippert of Five Star Contractor Lippert Tile introduced NTCA’s Jim Olson to their shareholders; Daltile and NTCA sponsored a lunch and members toured the new Daltile manufacturing plant in Dickson, Tenn. Board member Jesse Deason was instrumental in getting NTCA objectives to help raise tile education for Starnet members. Over 650 attendees came to Total Solutions Plus in Palm Springs. This was probably the best event to date since NTCA partnered with CTDA, TCNA and TCAA. Next TSP is November 4-7, 2017 at the Marriott Washington Wardman Park Hotel in Washington, D.C.
A new business training seminar is scheduled for February 23 – 24 in Dallas, for Five Star, Board Members and State Ambassadors, and open to the first 30 people to who sign up. Michael Stone will present this class called Making the Numbers Work. Info coming soon on details. A near-airport location will be established, and NTCA will offset some travel costs. Training and Education trailer sponsorships for all three vehicles have been sold out. Dave Rogers of Welch Tile and Marble is the chair of the Training and Education Committee, working with Jim Olson to reorganize the committee and subcommittees to reach goals. The first six months of the Apprenticeship Program are complete. Year one should be complete by Coverings. Becky Serbin is exploring how to incorporate this program into technical and trade school curricula. Each month, we select a specific benefit of NTCA membership and present it in detail to give you an idea of how joining NTCA can enhance and support your business. As a year-end recap, we present the whole range of benefits – and counting – that come with NTCA. We say “and counting” because NTCA staff are constantly working to add even MORE benefits and enhancements to NTCA membership. If you’re more video oriented, visit http://www.tile-assn.com/?page =Membership to see our NTCA Membership Video, debuted in January 2016, that gives you a fast-paced view of all NTCA has to offer. That same page has board advisor Dan Welch’s testimonial on how NTCA has helped his business and that of other NTCA members. 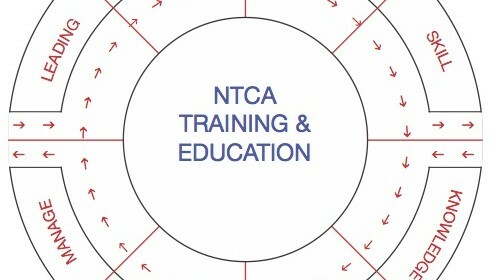 NTCA Reference Manual: A comprehensive culmination of knowledge and research and development of the Technical Committee members, ceramic tile contractors, distributors, manufacturers and others allied to the ceramic tile industry. 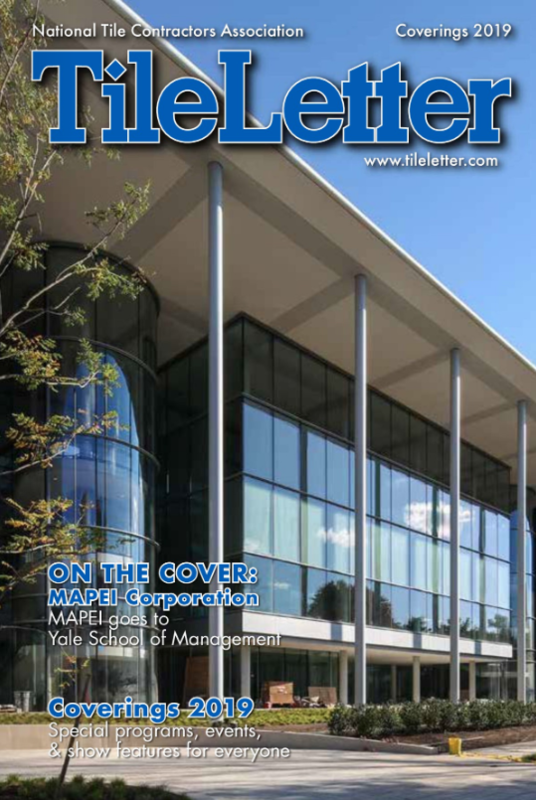 TileLetter Magazine: This publication is geared toward the contractor’s business, including installation advice, new technology and products, and best business practices. 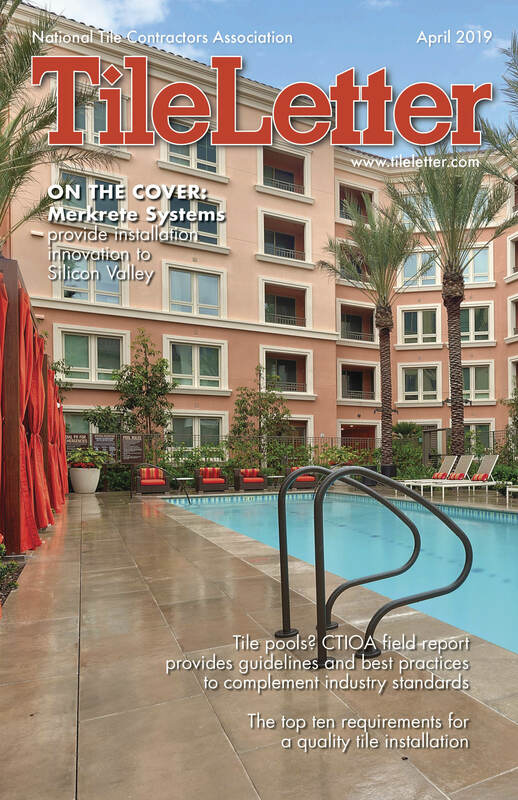 Published 15 times a year – 12 monthly issues, a Coverings issue and a TRENDS and TECH issue. TCNA Handbook – The TCNA Handbook for Ceramic, Glass and Stone Tile Installation is a guide to assist in clarifying and standardizing installation specifications for tile. Each installation recommendation, or method, requires a properly designed, constructed, and prepared substructure using materials and construction techniques that meet nationally recognized material and construction standards. All members receive a copy. News & Views eNewsletter: Twice monthly, our News & Views eNewsletter is emailed to all members to keep you informed of all industry and association activities. NTCA Workshops and Webinars and CTEF Educational Programs: We travel throughout the country providing free educational workshops to those in the tile industry, made possible by generous host sites. NTCA also offers free monthly online webinars presented by industry experts, easily accessible via computer at home or office. Installation Videos/Tile TV: Available on DVD, NTCA continues to pave the way in technical education with instructional videos for you and your employees. View additional “Tile Tips” and bi-monthly dedicated tile broadcasts at www.iwantmytiletv.com. NTCA University Discount – NTCA University offers classes in Management, Marketing and Finance to bridge the gap between a successful tile job and a successful tile business. The current introductory price for NTCA Contractor Members only is $99/year which gets you full, unlimited access to all NTCAU courses for all of your employees! Tom Ade Scholarship – The NTCA “Tom Ade” Ceramic Tile Scholarship has been established by the National Tile Contractors Association to provide educational opportunities for children or grandchildren of NTCA Contractor Members. Total Solutions Plus: This annual leadership conference focuses on technical and business education. TSP brings together the industry’s leading manufacturers, distributors, and contractors all under one roof for a unique experience. NTCA Membership Directory: As a member, your listing in the directory is an indispensable tool for referrals to the very best manufacturers, distributors, contractors, architects, designers, and builders. Partnering for Success Voucher Program: Our manufacturing sponsors feel so strongly about the value the NTCA provides its members that they will more than offset your investment with product vouchers – to the tune of $1,800 a year. Marketing Program: Professional marketing tools have been designed and written to make it easy, quick and affordable for you to promote your services, whether you are focused on commercial contracts or residential customers. NTCA Contractors Safety Program: The NTCA Contractor Safety Program is different from other safety programs because it was created to meet the specific needs of tile contractors, and is available only to NTCA members. Five Star Contractor Program: Add the NTCA Five Star logo to your already strong list of credentials, heralding your high level of professionalism. Take advantage too of sneak peeks of new technologies and special Five Star Contractor summit meetings to get a leg up on the competition. Discount for CTI Program – The Certified Tile Installer (CTI ) Program is a National Standard for Tile Installation to ensure that ceramic tile gets installed correctly the first time. NTCA members receive $50 off CTI testing. Bid RX Prescription Program: BidRx is a secure, internet website that links members with pharmacies, manufacturers, prescribers and payers so all can make better decisions when purchasing prescription medications. Choose among pharmacies that are competing for prescription medication business and get the best price. PartnerShip® shipping discount program: PartnerShip®, the endorsed shipping management provider of NTCA, offers shipping discounts to all NTCA members on select FedEx® services, as well as savings on less-than-truckload (LTL) freight shipments arranged through PartnerShip. Free, with no minimums required. Property and Liability Insurance: For NTCA members only, this program covers all aspects of insurance needs for the tile contractor. LegalShield – IDT Plans/Legal Plans: Everyone deserves affordable legal and identity theft protection. With LegalShield on your side, you have the power to access legal and identity theft advice and services when you need them, all for one low monthly fee. Last month I was happy to announce that the first six months of the Finisher Apprentice program had been completed. The functional wheel diagram shows that people can enter and leave training at various points in their career. If someone does want career development, there will be courses available based on their certain skill level. The wheel shows the job function for each type of employee. As we get ready for the holidays and the start of a new year, I wanted to take some time to tell you about the changes in the Training and Education Committee. Our goal has always been to have courses available for all skill sets but all of my time has been devoted to apprenticeship. In order to get the advanced courses created, two new subcommittees have been created to help determine courses that are needed and to write the scripts for the courses. These two subcommittees were developed to ensure that we have continuing education available for everyone that would like to advance beyond a journey setter. The two subcommittees are CEU Technical and CEU Management. The CEU Technical subcommittee is chaired by Rod Owen, of C.C. Owen Co. This group will be focused on creating courses for the journey setter, master setter, and foreman. Some of the categories will include new product training, documentation, soft skills, and field risk management. The CEU Management subcommittee is chaired by Dirk Sullivan of Hawthorne Tile. This group will be focused on creating courses for field supervisors, estimators, project managers, and upper management. Some of the categories will include estimating, project management, and running a tile business. Depending on the size of your tile contractor business you could be wearing one hat or several. These courses will take into consideration all company sizes. It does not matter if you leave your current company and go elsewhere or start your own business, because all of these courses will be designed so that you can continue your education when you are ready to learn. Or if you are content with your current position and do not want to pursue advancement, you are not required to keep moving along the wheel until you are a business owner. The changes that were made to the Training and Education committee will add value in the long run to all of our contractors’ businesses. As with the apprenticeship courses, these will take a little while to develop but I am looking forward to working with both of the subcommittees in 2017 to create courses that can be used by everyone. Remember, you can purchase your all-subscription access by visiting the NTCA store. Make sure that you are logged in to get your introductory pricing. If you purchase this subscription, you will have access to all of the learning content, including anything new that is created, through December 31, 2017. These specially adapted smart homes are built through the Gary Sinise Foundation’s R.I.S.E. (Restoring Independence Supporting Empowerment) program, with support from many donors across the country. On September 23, NTCA participated in a groundbreaking ceremony for a specially adapted custom smart home that is being built by the Gary Sinise Foundation through its R.I.S.E (Restoring Independence Supporting Empowerment) program (www.GarySiniseFoundation.org) for U.S. Marine Sergeant Michael Frazier (Ret.) in Pittsboro, N.C.
Paige Wadford Smith of NTCA Five Star Contractor Neuse Tile Service, Youngsville, N.C., was on hand to represent NTCA at the ceremony. These specially adapted smart homes are built through the Gary Sinise Foundation’s R.I.S.E. (Restoring Independence Supporting Empowerment) program, with support from many donors across the country. These include Dr. Hans-Peter Wild, The Marine Corps Scholarship Foundation and The Home Depot Foundation, together with building partners that include Shubert Design Furniture, Core Brands, National Wood Flooring Association, National Tile Contractors Association, GE, Sunbelt Rentals, Benjamin Moore, National Association of Home Builders, James Hardie, North American Van Lines, MAPEI, Crossville, Inc., Broan NuTone, American Airlines, BrightView, and Hearthstone Luxury Homes, an independently owned and operated franchise of Arthur Rutenberg Homes. These partners joined the greater Triangle community to celebrate the groundbreaking ceremony for a specially adapted custom smart home for USMC Sgt. Frazier. Marine Sgt. Frazier with wife Monica and daughter Sophia at the groundbreaking. The couple is expecting a second child soon. Sgt. Frazier grew up in Pittsburgh, Pa. After the attacks on 9/11, he felt a sense of duty and enlisted in the Marines in 2005. He served seven years with three combat deployments to Iraq and one to Afghanistan. While on patrol in 2011 in Helmand Province, he stepped on an improvised explosive device (IED). The blast took both of his legs and much of the use of his right arm. During his recovery at Walter Reed National Medical Center, Sgt. Frazier met his wife Monica, who worked as a U.S. Navy Hospital Corpsman. They were married in 2012. Michael retired from the Marines two months later, and Monica gave birth to their daughter Sophia. They are expecting their second child soon. The couple looks forward to settling down in North Carolina and is grateful to be receiving a specially adapted custom smart home through the Gary Sinise Foundation’s R.I.S.E. program. These specially adapted smart homes (51 that are underway or completed) make the simple tasks of everyday life – climbing stairs, reaching a high shelf, getting in and out of the bathroom – more accessible for Sgt. Frazier and other severely wounded veterans. These one-of-a-kind, mortgage-free homes are being built nationwide, each for a wounded hero, their caregivers and families. With a place to truly call home, they will now be able to move forward with their lives. Mike Franceschelli, CEO of Florida Tile, Inc., since 2010, was recently named president of Tile Council of North America, for a two-year term. He’s led the company to steady growth in sales and profits while also expanding their manufacturing and distribution capabilities. Franceschelli has taken an active role in TCNA, serving four years as 2nd vice president before accepting his current post. His commitment to raising the bar in the tile industry is reflected in the goals that he has set for himself and TCNA for the coming year. His list of objectives for the coming year highlight the ambition and dedication he and TCNA have for the tile industry. Good things are happening. At the 2016 edition of Cersaie, the international exhibition of ceramic tile and bathroom furnishings held in Bologna from September 26-30 in cooperation with BolognaFiere, nearly 5,000 more visitors attended than in 2015 – an increase of 4.7%. This brought the total attendance to more than 106,000, with growth of Italian and international visitors. As the figures above indicate, ceramic tile was the best represented sector, followed by bathroom furnishings, confirming Cersaie’s position as Italy’s largest bathroom furnishing exhibition and one of the leading shows for the sector in Europe. In addition, the show’s appeal coupled with a strong economy in several international markets fueled double-figure attendance growth, including a recovery in numbers of Italian visitors after several years of stagnation and a continued rise in international visitors. Cersaie remains a key event for developing global business in the ceramic floor and wall tile and bathroom furnishing sectors, and is a powerful engine for international trade. Cersaie is a magnet for architects, interior designers, tile installers and the general public. 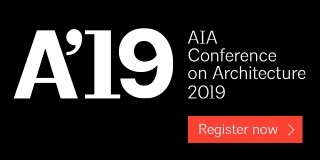 Lord Norman Foster was the eighth consecutive Pritzker Architecture Prize winner to give Cersaie’s keynote lecture to more than 2,000 people. The ‘Cer-Sail’ exhibition, curated by Angelo Dall’Aglio and Davide Vercelli, attracted large numbers of attendees. The “building, dwelling, thinking” cultural program earned architects education credits along with those gained for attendance of the show itself. Practical demonstrations also drew large crowds, such as the presentation of the industry-average EPD and the technical meetings held in Tiling Town in partnership with the main professional associations. “Cersaie designs your home” was strongly attended by consumers interested in renovating their homes. Bologna Design Week was also a big success, with an evening program of cultural events held in a number of prestigious locations throughout the city. Collections with a random assortment of fragmented pieces lent an eclectic and playful visual narrative to the surface. Some designs are inspired by natural materials with a conglomerate look such as Ceppo di Gré, while others conjure a sense of handwork such as Venetian terrazzo and irregular stone mosaics. A few standout collections include: Bits, a reinterpretation of terrazzo flooring with square and irregular polygonal shapes, designed by Gordon Guillaumier for Ceramiche Piemme; and Sant’Agostino’s Set collection inspired by the hand-cut mosaic floors of Carlo Scarpa’s Olivetti showroom in Venice. Other collections include Raw by 14oraitaliana, Marvel Gems by Atlas Concorde, Pennellato by Campogalliano, Pietre di Paragone by Casalgrande Padana, Maku by Fap and Marmocrea by Fioranese. Intense blacks with matte finishes are making a strong statement this year. 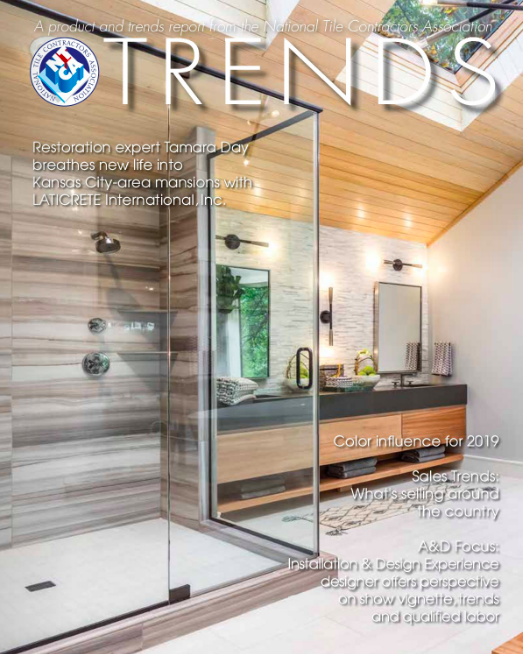 Meanwhile, blue – which has been popping up everywhere this year from fall fashion shows to hair color – is taking the tile industry by storm, expanding beyond last year’s marine palette to include dusty, vibrant, and sophisticated blue hues. For devotees of Le Corbusier, his preferred shades of ivory black and ultramarine blue from “Polychromie architecturale” are now available in ceramic tile thanks to a new project from Gigacer called LCS Ceramics. Other notable collections include Hops by 41zero42, Texture by Appiani, Marvel Gems by Atlas Concorde, Layers by Caesar, Earth and Pietre di Paragone by Casalgrande Padana, Sofia & Eve by Ceramica Bardelli, Tr3nd by Ergon, ColorNow by Fap, Blu Ponti by Francesco de Maio, Reve by Mirage, Materia by Novabell, 80s by Ornamenta, Metropaper by Sant’Agostino and Vetrite by Sicis. Good designers learn from history, borrowing elements from the past and infusing it with fresh ideas and cutting edge technologies to create something completely new. Retro is a trend that has been percolating for years, especially with the graphic appeal of cementine and maiolica, but now other historical movements have joined the fold, from the elegance of Art Deco to the bold shapes of Memphis. One collection that was actually revived from the 1960s is Blu Ponti by Francesco de Maio. Originally designed by Gio Ponti for the Hotel Parco dei Principi in Sorrento (the world’s first design hotel), a series of 30 blue and white decorations with geometric and naturalistic motifs are faithfully reproduced on 8”x8” ceramic tiles. Other retro tiles include XO by 14oraitaliana, Paper41 by 41zero42, Firenze Heritage by Fap, Cementine_Retro by Fioranese, Play by Imola, Hmade by Mirage, 80s by Ornamenta, Metrochic by Sant’Agostino and Aria by Verde1999. Adding a new twist to country style, wood, stone, brick and cotto are invigorated by modern schemes, hues and patterns. Antique stone with metallic accents, terracotta in quatrefoil shapes, and geometric patterns overlaid onto distressed wood planks are just a few of the ways tile companies are blending farmhouse charm with modern elegance. Collections include Alpes by ABK, Borgogna by Coem, Climb by Del Conca, Arezzo by Faetano, Firenze Heritage by Fap, Cottofaenza by LaFaenza, Materia by Novabell, Maison by Ricchetti, Faber by Sant’Agostino, Proxi by Settecento, Rivamancina by Tagina and Trecentogradi by Viva. Texture is the defining character of this year’s tile collections, which complements the many new textile-inspired lines. Designs range from lace, macramé, linen and madras to masculine suiting fabrics, leather, tweed and tartan. Whether woven, knitted, knotted, or layered, the designs add another tactile element to the hard surface. Arte Pura by Ceramiche Refin features three distinct designs that capture the feminine sensibility and fantastical world of Daniela Dallavalle, from imprints of lace and fragmented embroidery to layers of torn linen with frenetic doodles. Also of note is Vetrite, which turns Sicis fabrics into luxurious cladding via large-format thin glass panels. Additional collections include Crea by Ariana, Room by Atlas Concorde, Stone City by Del Conca, Lin_Side by Edilgres, Dream by Fondovalle, Trame by Lea, Reve by Mirage, TailorArt by Sant’Agostino and Aria by Verde1999. Boatman and Magnani, Inc., located in Capitol Heights, Md., has provided the Washington metropolitan area with ceramic tile, terrazzo, and natural stone work since 1960. Throughout the company’s 56-year history, Boatman and Magnani has earned an enduring reputation by delivering the area’s leading architects, general contractors, and owners the highest quality material and craftsmanship in a timely fashion. Boatman and Magnani has established a long list of satisfied clients and continues to strive for excellence in an ever-changing industry. As leaders in the tile, terrazzo, and stone industry, Boatman and Magnani owes its success to a great deal of hard work, dedication, intelligence and determination. It aims to give the client what they want, and do the best job possible. The company likes challenging work, and jobs that are unusual, big or small. Boatman and Magnani performs work for the federal government, District of Columbia, state governments, general contractors, and at times directly for architectural firms. For proof that no job is too large or too small, one needs to look no further than Boatman and Magnani‘s project list: the woman-owned tile, marble and terrazzo union contractor has supplied and carried out over 8,500 projects in its 56 year history. Some include intricate large-scale projects such as The U.S. Capitol Visitor Center, MGM Casino, The African American History Museum, U.S. Marshall Service, The New Doha International Airport, The Ronald Reagan Building and International Trade Center (Federal Triangle), Tyson‘s II Mall, The Willard Hotel and Office Building, International Square, The Library of Congress, National Gallery of Art, The President’s Guest House, and Postal Square. Boatman and Magnani also continually coordinates and executes smaller projects including: many of the area elementary, middle and high schools; high-end finish tenant spaces and law firms; hospitals, hotels, and private and public office buildings. The company prides itself in having the expertise and ability to tackle large, complicated private residences, where it has provided expert coordination and installation of tile, terrazzo, stone, marble, brick, and mosaics in some of the area’s premier homes. It currently employs 65 BAC/IMI Local 1 Union-trained tile, terrazzo and marble workers. Boatman and Magnani employs a very loyal, creative, knowledgeable staff of office/ senior project managers, estimators, draftspersons, and administrative personnel. It also takes pride and highly values its superintendents and skilled union labor force of foreman and field tile setters, terrazzo workers, and stone masons. When it finds someone with proficiency, the company knows it’s important to keep him or her on board. Some of Boatman and Magnani’s employees have over a 25-year tenure. Because of the close combination of employees at Boatman and Magnani, the company is able to be diversified and maintain stature at the forefront of the industry. The office is equipped with a state-of-the-art drafting and estimating department that takes pride in returning accurate bids, and generates shop drawings with precision. Boatman and Magnani is also equipped with a natural stone fabrication shop, employing talented, expert craftsmen and creating custom fabrications. The quality of craftsmanship that Boatman and Magnani’s field forces produce speaks for itself. Boatman and Magnani has earned a multitude of Washington Building Congress (WBC) Awards, including the WBC Star Award for Technical Excellence for The U.S. Capitol Visitor Center Project (which is one of the largest projects completed by Boatman and Magnani, Inc.) in Washington, D.C. It was also awarded the WBC Star Award for Excellence in the Face of Adversity for the Tyson’s II Project in McLean, Va., and the WBC Star Award for Technical Excellence for the Sports Club/LA Project at The Ritz Carlton Hotel in Washington, D.C.
Another large project completed by Boatman and Magnani was the Ronald Reagan Building and International Trade Center (Federal Triangle) in Washington, D.C. The work of over 150 valued employees was not unnoticed when Boatman and Magnani was awarded the prestigious Terrazzo Job of the Century by the National Terrazzo & Mosaic Association (NTMA). Boatman and Magnani continues to make its mark using time-honored principles and exceptional craftsmanship and looks forward to new installation challenges in the future. The company joined NTCA and pursued Five Star Contractor status to be considered part of a group of organizations that exemplify quality and integrity in the tile industry. 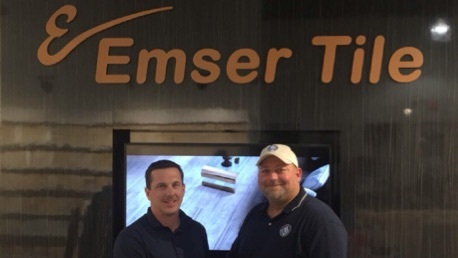 Charles Nolen was recently named an Indiana State Ambassador for the National Tile Contractor’s Association (NTCA), an adjunct role to his position with Miller’s Flooring America, which does all types of flooring installation in Lafayette, Ind. In 2016, after more than 20 years in the industry, Nolen became a Certified Tile Installer (CTI) at Coverings 16 this past April. Certification is one of the most important advances being made in the industry as a whole, Nolen said. It is a way for the Ceramic Tile Education Foundation, “to put the stamp on [the industry] and say, ‘Hey look, there are great installers out there’.” Certification opened up a lot of doors for Nolen, only the most recent of which was becoming the NTCA’s Indiana State Ambassador. “Being able to display the logo and holding the card is priceless,” Nolen said. Nestled among rocket ships and high-tech shuttle launch simulators is Kennedy Space Center Visitor Complex’s Astronaut Encounter Theater. Once guests are through the doors of the building, the renovated lobby and theater transport them to an area that resembles a space ship – complete with astronauts. The Kennedy Space Center wanted the project completed by the late-November holiday rush – but didn’t begin until November 8. Originally built in the 1970s, the Astronaut Encounter Theater has played a vital role in educating visitors. This exciting presentation features a veteran NASA astronaut each day, providing them with a stage to share a first-hand account of their missions and experiences. Guests gather in the theater where the astronaut of the day provides a presentation about their experience, followed by a question and answer session. The lobby serves as a meet-and-greet area, where guests can take pictures with the astronaut. Prior to the renovation, both the lobby and theater needed updating. The work of designer Michael Rainey of DesignShop and its team, the new building design was inspired by the rich history of Kennedy Space Center Visitor Complex and its ongoing drive for innovation. Kennedy Space Center Visitor Complex hoped to create a design that was functional and durable, all while presenting a space that provides a dazzling backdrop for astronauts to take photos with guests. Even though the renovation seemed simple, the project was limited to a tight window of time. Slated for early November 2015, Kennedy Space Center Visitor Complex requested to have the renovation finished prior to the holiday rush, which begins in late November. Because of the firm completion date, the renovation team worked on an eight-day schedule to complete demos, preparations, and installation. Kicking off on November 8, the team removed the vinyl tile from the lobby areas and created a blank canvas to create a futuristic look. To integrate the LED lights into the tile, every light on the channel had to be intricately cut, manipulated, and soldered to each side of the hexagonal tile. While the actual theater was limited in its design, the architectural team was able to be creative with the lobby area, crafting a space that would be ideal for guest photos. The focus of the lobby design was the flooring, which was designed using hexagon-shaped tile and LED lighting. Based on the renderings, Rainey sought carpeting and hexagonal tile that would bring the perfect balance of drama and neutrality to the active foyer. To select the appropriate tile, Rainey worked with Bob Moore of Mr. David’s Flooring International, LLC, located out of the company’s St. Augustine, Fla., office. Due to the durability and low maintenance benefits of tile, it was decided to switch from vinyl to ceramic tile, particularly with the lobby being such a high-traffic area, seeing over a million visitors each year. Daltile was selected based on prior experience – the team knew that Daltile had a tile that could bring the design vision to reality. This subtle-yet-dramatic tile design complemented the network of LED lights that were installed into the floor surface. To install the LED lights into the flooring, the project members worked with a team of engineers. In order to integrate the light into the tile, every light on the channel had to be intricately cut, manipulated, and soldered to each side of the hexagonal tile. “We had to be very precise with how we cut the lights, as well as the tile, to ensure that the design could be brought to life. The end result was spectacular,” added Moore. Daltile’s Beehive™ hexagon porcelain tile was chosen for aesthetics and durability, and won out over the original vinyl tile specified. In the theater area, the project team removed the wall panels and replaced them with wall carpeting. The carpets of the theater floor, stage and green rooms were also replaced, updating the areas with a neutral carpet tile to place emphasis on the painted ceiling and stage area. The simple updates to the theatre, in addition to the overhaul of the lobby area, revamped the entire space, providing a modern area for guests to enjoy. The project was completed on November 15, 2015 – just in time for the holiday rush. With the new design, the theater reflects the modern aesthetic of the surrounding technology and innovations. The new space offers the perfect location to meet an astronaut. Additionally, the Daltile Beehive tile provided the ideal solution for the high-traffic area. Kennedy Space Center Visitor Complex was pleased with the final result, combining function and space-age design. The Daltile Beehive tile provided the ideal solution for the design, ensuring that the flooring will withstand the thousands of guests that will visit the Astronaut Encounter Theater for years to come.